Although you might be suspicious that something sounds too good to be true, not every scam you come across on the Internet will immediately set off alarm bells. After all, what’s the worst that could come from liking and sharing a post on Facebook, beyond the fact that a new Audi R8 V8 or a diamond ring from Tiffany & Co. won’t become yours? Some scams exist (and thrive) just to get those valuable likes and shares, and gain an audience for future scams. In a blog post by Internet security company Avast, author Deborah Salmi points out a few fake giveaways she’s come across in the past week, promising the chance to get a free car, or diamond jewelry just for liking and sharing a post on Facebook. The instructions are simple: for a chance to win, like the page, request the color of car you want in the comments and then share with your friends. 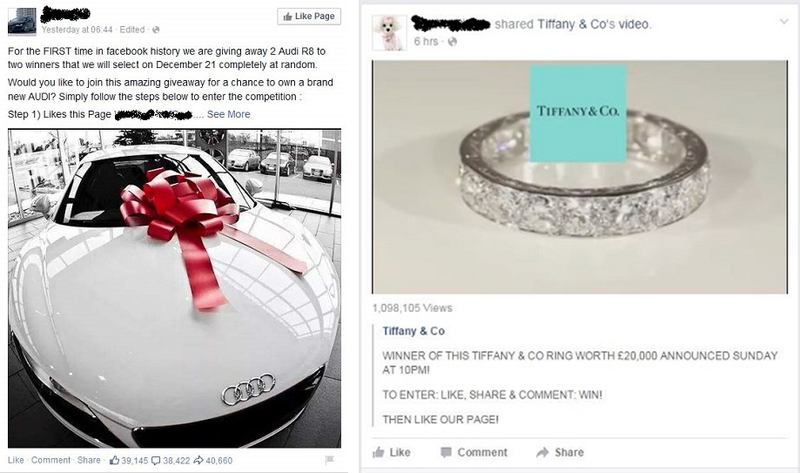 Or share a post from a fake Tiffany & Co (not Co., a dead giveaway) for a diamond ring. The thing is, though these scams might not even direct users to a spam link or ask for personal information, they’re what’s known as like-farming: a way to get as many page likes and shares as quickly as possible. Once that happens, Facebook’s algorithm pushes these posts to others’ newsfeeds, continuing the vicious scam cycle. Later the pages can be repurposed for survey scams or other unsavory things, with a large audience served up and ready to go after those giveaway tricks. Or those pages with all those fans can be sold on the black market to scammers with even scammier ideas. To avoid like-farming scams on Facebook, Avast suggests alerting your friends when they share a fake page with you, and not clicking on anything or participating in the fake giveaway. Even if it’s uncomfortable to inform your mother-in-law at Thanksgiving dinner that she fell for something that’s so clearly fake, if you don’t want that scam popping up again in your newsfeed, it’s best to speak up. Remember, always: if it seems too good to be true, it probably is. Previous Marriott, Samsung Partner To Offer Hotel Guests Virtual Reality Headsets, Because Why Not?